Home » Posts Tagged "SB 70"
It’s Turnaround! What’s gone? What’s Where? KNEA has been following, testifying on, and reporting here on a number of bills in the first half of the session. While generally speaking, if a bill has not passed its chamber of origin by Turnaround, it is considered dead for the year. There are some exceptions to this however. Bills that were introduced in or referred to the House and Senate Federal and State Affairs, Senate Ways and Means, Senate Assessment and Taxation, House committees on Calendar and Printing, Appropriations, or Taxation are exempt from timelines. A common practice at Turnaround is “blessing” a bill. A bill that is in a non-exempt committee and has not been acted upon can be referred to an exempt committee and so kept alive into the second half of the session. Here then is the status of a number of bills we have been tracking. HB 2139, repealing in-state tuition for the children of undocumented aliens. KNEA opposes this bill. It still awaits action in the House. HB 2034, Dave Trabert’s “minority report” bill changing collective bargaining. KNEA opposes this bill. It has been killed. HB 2199, mandating opt-in for human sexuality education. KNEA opposes this bill. It awaits action in the House. HB 2292, repealing the Kansas College and Career Ready Standards, Next Generation Science Standards, ending use of AP and International Baccalaureate programs. KNEA opposes this bill. It awaits action in the House. HB 2257, the education community consensus collective bargaining bill. KNEA supports this bill. It was amended into HB 2326. HB 2236, the bill ending exclusive bargaining rights. KNEA opposed this bill as introduced. It now contains the education community’s consensus collective bargaining bill. It passed the full House and now goes to the Senate. 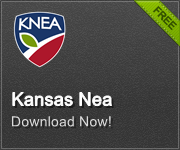 KNEA now supports the bill. HB 2220, restoring teacher due process. KNEA supports this bill. It awaits action in the House. HB 2031, school district plans addressing child sexual abuse. KNEA supports this bill. It awaits action in the House. HB 2232, personal financial literacy course as a graduation requirement. KNEA opposes this bill. It awaits action in the House. HB 2234, prohibiting post-secondary institution employees from using their titles when writing in the newspaper. KNEA opposes this bill. It awaits action in the House. HB 2028, creating a legislative committee to write education standards. KNEA opposes this bill. It awaits action in the House. SB 2, authorizing school districts to offer multi-year contracts to teachers. KNEA is neutral on this bill. It awaits action in the Senate. SB 60, participation by homeschool and private school students in KSHSAA activities. KNEA opposed this bill as introduced. It was significantly amended and has been passed by the Senate. The bill is now in the House. KNEA is neutral on the bill as amended. SB 70, background checks and fingerprinting of teachers every five years. KNEA opposes this bill. It has passed the Senate and is now in the House. SB 71, changing the LOB calculation creating a cut in supplemental general state aid in the current year. KNEA opposes this bill. It awaits action in the Senate. SB 56, Removing the affirmative defense from K-12 public, private, or parochial school teachers. KNEA opposes this bill. It has passed the Senate and is now in the House. SB 67, Common Core repeal (see HB 2292). KNEA opposes this bill. It awaits action in the Senate. SB 212, prohibiting the use of payroll deduction for dues collection. KNEA opposes this bill. It awaits action in the Senate. SB 179, modifying the Public Employer Employee Relations Act (PEERA) limiting negotiations and eliminating the Public Employees Relations Board. KNEA opposes this bill. It awaits action in the Senate. For information on other bills we’ve been tracking this session, click on the “Bill Quick Look” link to the right. For information on the status of collective bargaining, see our post below. This bill would require every teacher to be fingerprinted upon applying for an initial teaching license and every time a teacher renews a teaching license. Fingerprints would have to be taken by a qualified law enforcement agency. A fingerprinting fee and a background fee would apply each time the teacher renews her license. This bill would also require any other person who is employed by a school district in a position with direct contact with students to be fingerprinted by a qualified law enforcement agency prior to commencing any work involving students, and every 5 years thereafter. Under the bill, teachers convicted of any of the crimes specified in K.S.A. 72-1397(a) or (b), or who entered into a diversion after having been charged with a crime specified in K.S.A. 72-1397(b) will be required to notify the State Board of Education of the conviction or diversion, and the KSBE will revoke that teacher’s license. The points, bullet items, descriptions and / or summaries in this post are intended as a quick “thumbnail sketch” of a particular bill. Please view the full bill language on the Kansas Legislature website for more information and complete language and changes for each bill.